Menus are underrated marketing tools that restaurants can use to lure in customers. Although food is the primary reason why customers eat at restaurants, there are other factors that need to be considered, and one of them is marketing. Menus assist in the promotion format of restaurants. Depending on the type of restaurant (either formal or casual), there are no limits on the designs that can be incorporated in menus. You can go for very colorful designs or go for a more minimalist design, depending on your preference. So to help you out, here are some food and drink menus you can use for your own restaurant. This dinner party menu template is perfect for your food and drink restaurant. Edit the image in this template and use a photo from your own restaurant. Does your restaurant specialize in serving breakfast dishes the whole day? 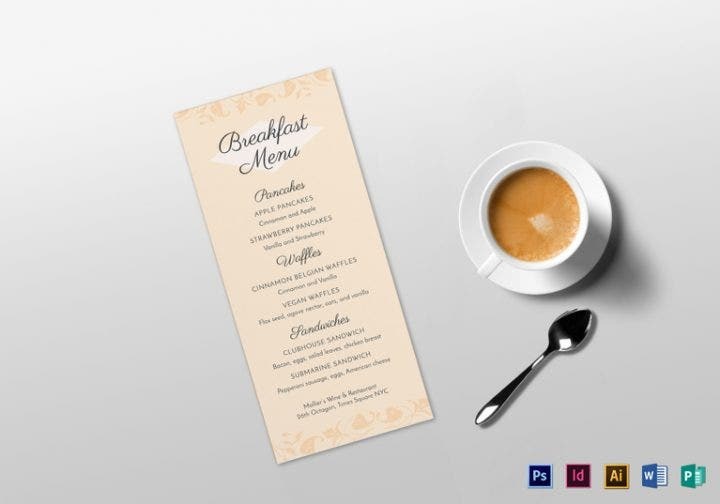 Then this elegant breakfast menu template is perfect for your restaurant. Even if you do not serve breakfast the whole day but switch your menu during breakfast, lunch, and dinner, then this template is ideal for your restaurant. Pizza is everyone’s favorite food. 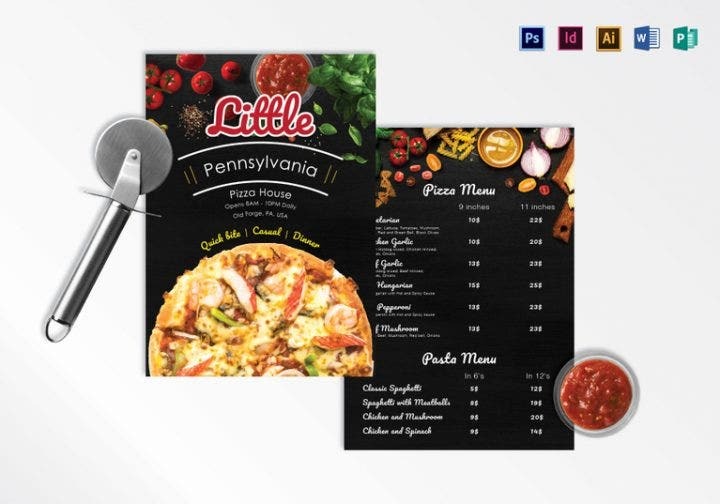 Use this pizza menu template if you are serving some very delicious mouthwatering pizza. Where is the best place to enjoy food and drinks at the same time? Then a sports bar is your best answer. Sports bars are the best venues to watch the latest sporting events together with family and friends, chugging down a glass of beer while munching on a juicy hamburger. 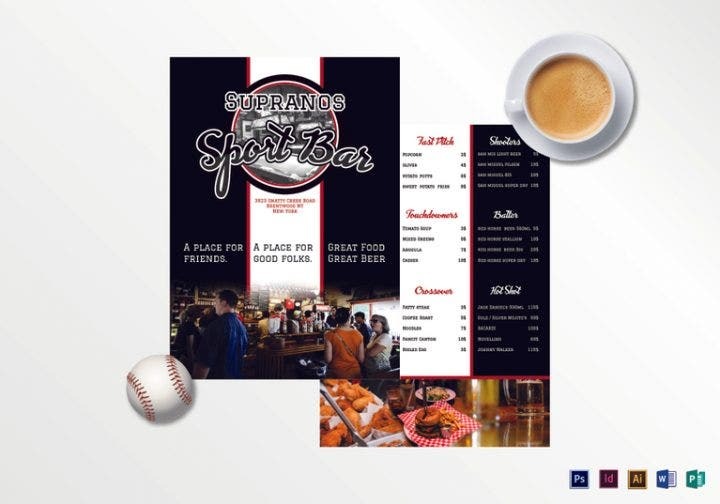 This sports bar template is something you should definitely purchase. 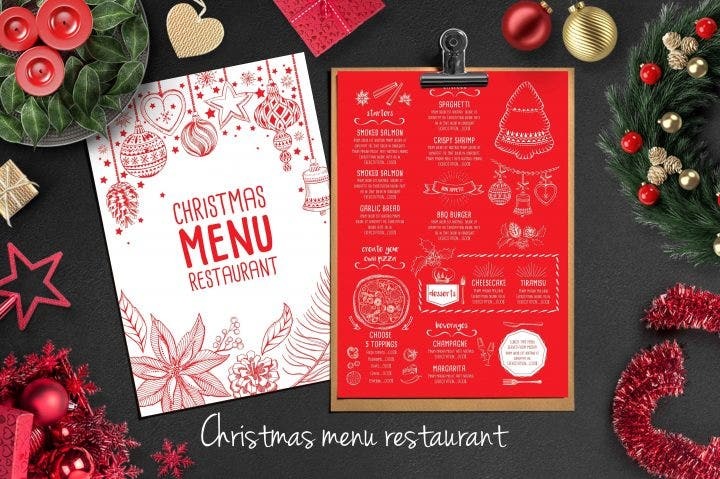 Christmas is less than a month away and you should start looking for some holiday menu designs for your restaurant. This template is your best option. This template uses images of Christmas balls, laurel leaves, and other Christmas-related images. Christmas, together with Thanksgiving, Easter, Valentine’s, Mother’s and Father’s Day, and St. Patrick’s Day are some of the holidays you can celebrate in your restaurant. You can change your menu designs to fit each celebration like in the Christmas template above as long you still retain the core concept you are using in your restaurant. 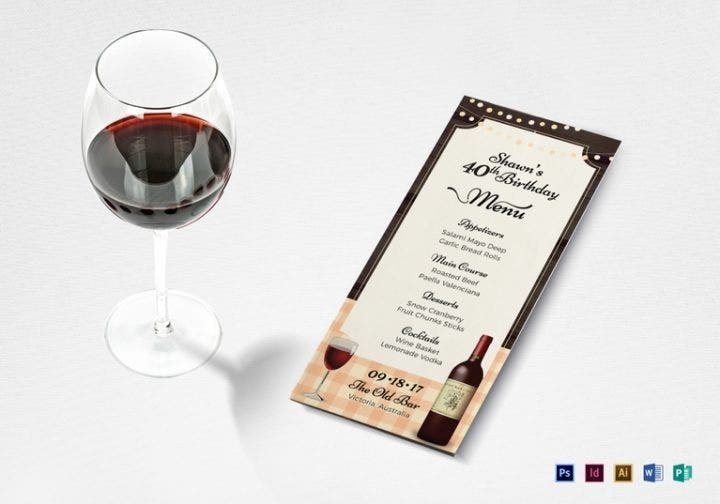 To increase the marketing and promotion of your restaurant, use this 40th-year birthday menu template and host a birthday celebration in your own restaurant. You can also change the themes in your restaurant to fit the age of the birthday celebrant. This elegant menu template uses some very beautiful designs. 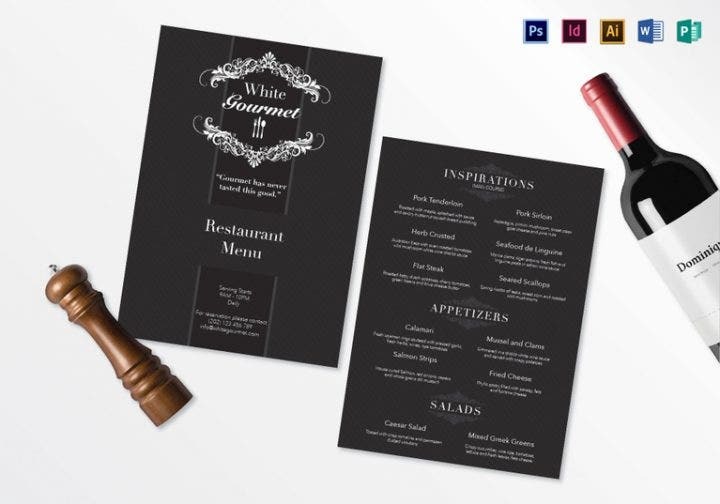 Black and white colors are typically used for formal restaurants due to their formal yet elegant design, but you can also use this template for any type of restaurant. This blank menu template is fully editable and you can add your own spin to its design. Free fonts are available in this template for your convenience. Christmas may be one month away, but Thanksgiving is only a few days away. 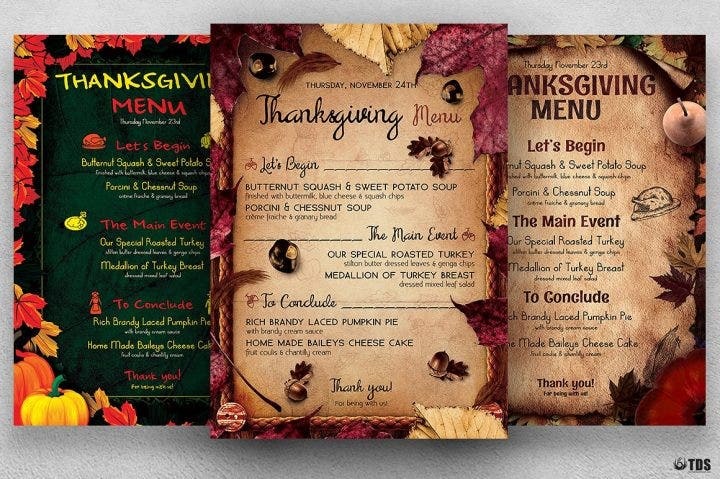 Here is another seasonal menu template which you can use for your restaurant every Thanksgiving. Autumn-related images are mostly used in this template since Thanksgiving is celebrated during the autumn season. Similar to the Christmas menu and flyer template above, you can add different designs in your restaurant menu during special holidays or even during the different four seasons (winter, autumn, spring, and summer). Use season-specific designs for the different seasons like snowflakes and Christmas trees for winter; autumn leaves and baked turkey for autumn (as seen in this template); spring blossoms and Easter eggs for spring; and beach balls, umbrellas, and sunglasses for summer. Chalkboard designs have been making a wave the past few years. They are used for just about every purpose, including menu designs. 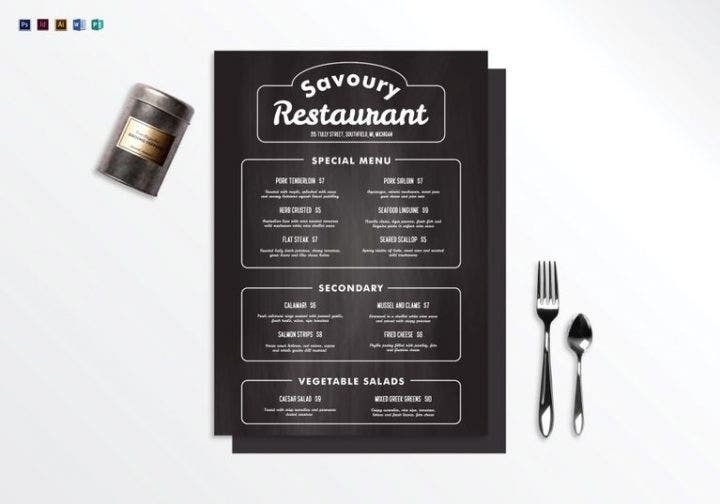 Continue that trend and use this chalkboard menu template for your own restaurant. Chalkboard menus were originally used in meat shops and restaurants during the 1800s when butchers and restaurant owners listed down their food items and mostly placed them outside their shops. Chalkboards were not only limited to the food business but to the classroom setting as well. They have since evolved over the years and now are used heavily in graphic design. This vintage menu template resembles a sample chalkboard menu template, but it still looks attractive nonetheless. If you have extra funds, purchase this template as well as the chalkboard template above and use it interchangeably for your restaurant. This simple menu template uses a flat and minimalist design which can be suitable for any type of restaurant. If you are going for a simple yet attractive menu design, then purchase this template. 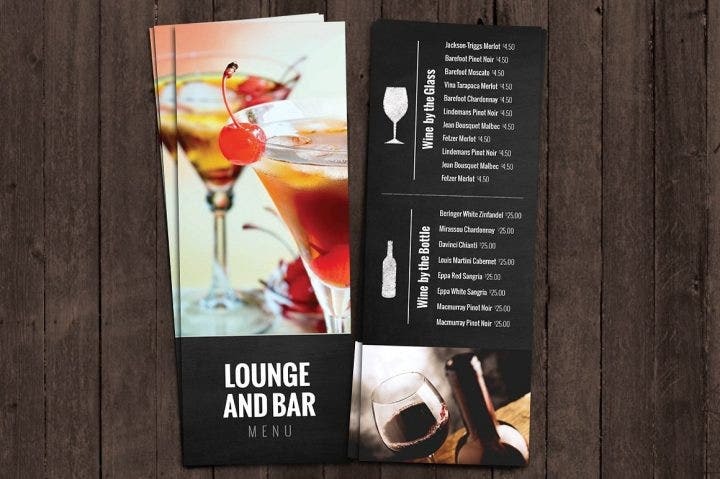 Purchase this bar and lounge sample drink menu template if you are serving some cocktails and beer in your restaurant. Edit the images and replace with the drinks you are actually serving. If you have an extensive dish catalog in your restaurant, tri-fold menus are a great fit. They perfectly arrange your menu items without compromising the design as well as space. 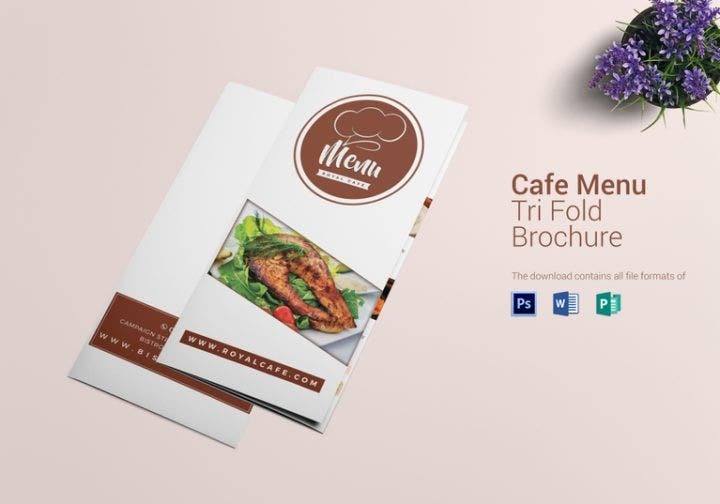 If you are planning to purchase a tri-fold menu, then this template is your only option. Here is another vintage menu template you can use for your restaurant. This menu template uses some vintage font styles which are very popular designs to use in restaurants. Probably the most basic function of a menu is to showcase or present to customers what dishes the restaurant is serving. Menus help guide customers on what they want to delivery order and also convince them to place orders for new dishes which are being served in the restaurant. Depending on the size of the restaurant, the restaurant’s management team does not need a thousand menu copies to be given out to each customer. 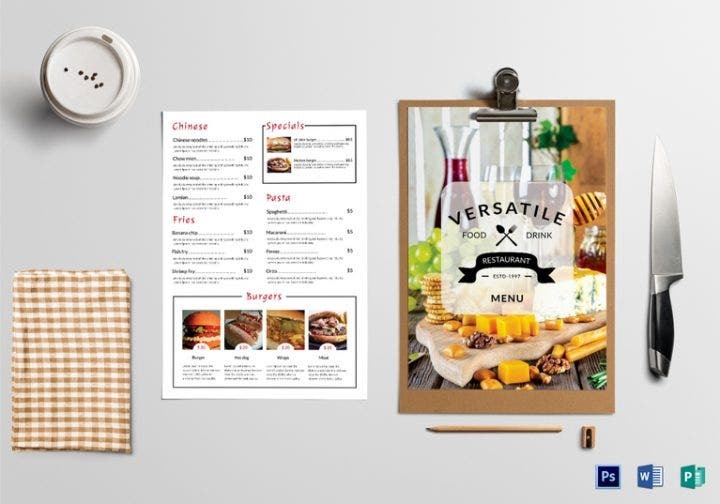 Additionally, menus can be printed in a section of a restaurant where customers can see them clearly (like in a fast food chain, sports bar/restaurant, or food stall). Menus keep things organized in the restaurant and, without them, customers would be in disarray and the restaurant would end up in chaos, especially during lunch and dinner times respectively. As previously mentioned, there are no limits on how menu designs can be accomplished. For example, despite formal restaurants following more strict rules of decorum, menu designs for these restaurants can still be very attractive. Making designs for your restaurant menus should only follow one rule: it should be uniform with the concept the restaurant is using. 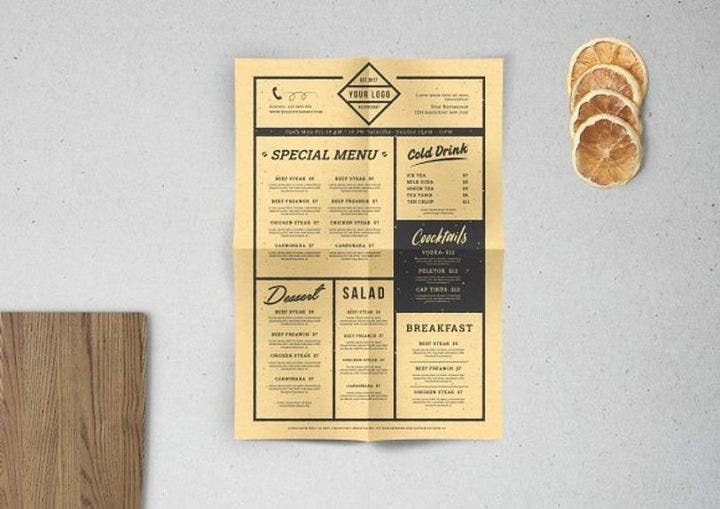 For instance, if the restaurant is incorporating a classic 1950s American diner theme (neon lights, vinyl records, black and white floor tiles, bacon and eggs, and pancake layers), then you should do the same for your menu designs. Going for a different theme will ruin the consistency of your restaurant concept and might cause some issues with some of your customers. 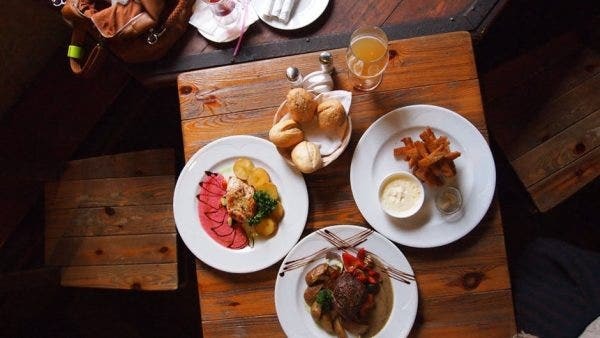 Restaurants do not only use menus to inform their customers of the dishes they are serving, but they also use menus to notify customers of promotions or other activities they are planning to host. The quality and the price of food are only two aspects of the restaurant’s marketing scheme. Menus assist restaurants in making sure customers book a return trip to their respective restaurants. Make your restaurant stand out from the competition by offering a unique yet elegant menu design. A successful restaurant gets rave reviews for their food, but if a restaurant gets similar reactions from customers for both the food and the menu design, then the restaurant is set up for success. Before you make any menu template purchase, there are some things you need to remember. The items listed below are not only limited to drink and food menus, but to menu templates in general. Take note of these things so that you get quality designs as well as value for your money. 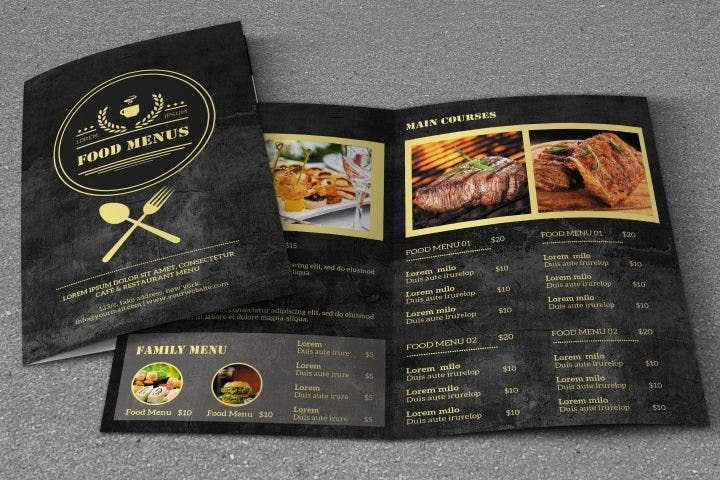 Get your creative juices flowing and make your menu designs attractive. Customers will surely appreciate a well-made menu design and will definitely search for it during their next visit. 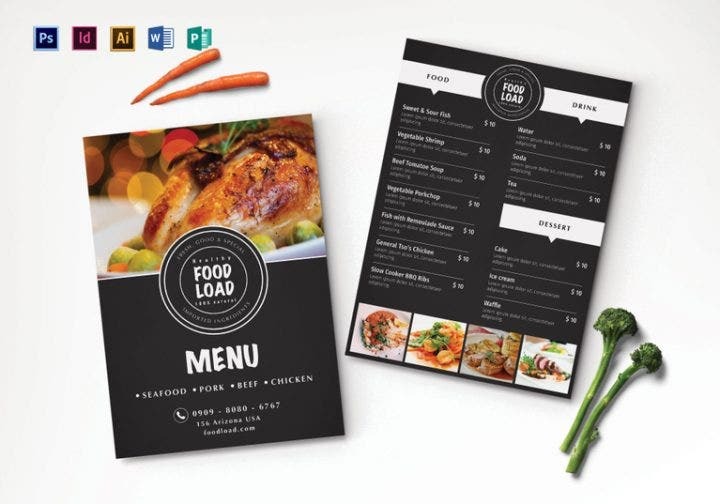 Whether you make your own menu design or purchase a template from online free graphic design shops, make sure the final look for the menu will leave your customers in awe. Steer clear of the usual black and white colors in your designs and incorporate a little bit of color to add some aesthetic appeal to your menu. Although the black and white combination looks attractive especially when paired with vintage and retro details, additional colors will not hurt the overall look of your design. In fact, they can even enhance it. If you really intend to use black and white for your menu design, add a third or fourth color to make it more visually appealing. Incorporate the colors in the background, border designs, or in the images. A suggestion you can use for your menu design regarding color is to match it with the restaurant’s concept. If you are selling Mexican food, then use some red, white, and green colors in your menu as they resemble Mexico’s national colors and the same colors can also be found in most of their food. If you are selling seafood, meanwhile, you can use some blue, brown, and green combinations as they represent the colors of the ocean and seafood, respectively. Those are just examples you can incorporate into your menu designs. When you are about to purchase order templates, you have the option to choose between physical and digital templates. Physical templates are handmade templates that need to be delivered to your doorstep while digital templates are created using graphic design software such as Adobe Photoshop or Adobe Illustrator, which are sent to your email address or website. There is another thing you need to consider when you are about to purchase menu templates; you need to get the approval of your management team or your customers. If the restaurant is owned by a partnership or corporation, all decisions should be approved by the majority and not just a single person. 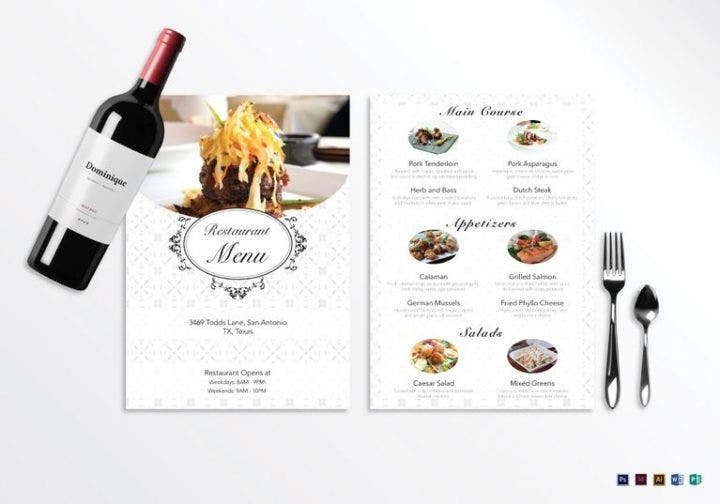 But if you are the sole proprietor of the restaurant and all decisions go through you, first present the menu designs to a small number of customers (preferably individuals who are also in the food inventory business) and get their reaction to the menu template you chose.